Broncolin is a dietary supplement made of honey syrup with natural plant extracts. Instructions: Take a tea spoon (7g) every 4 hours. Shake before used. Over the counter medicine. Product of Mexico. 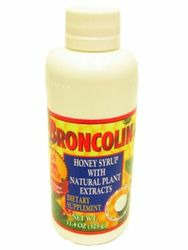 Descripcion del Fabricante: Broncolin� ha desarrollado ya por muchos a�os Jarabes a base de Miel de Abeja y Extractos Herbales, encontrando el equilibrio ideal entre las bondades de estos maravillosos ingredientes, teniendo como resultado productos de una gran calidad que han sido aprobados por las familias mexicanas. Broncolin� formula sus jarabes en distintas presentaciones para diferentes necesidades. The best natural upper respitory Med out there!! My kids have used this product since they have been very little. Years later we are still using this product. I am happy it is now available legally. For those who are hacking all over the place...you need this on your desk at work and when outing in the Fall crisp air!! ProsNatural and pleasant tasting!! Not nasty at all. ConsNot available in any regular store to get some fast!! I'm asthmatic , I found this product on the shelf at Walt-Mart, It is amazing how quickly it help me get over a bad cold that was worsened by my asthma. It even help relive some of my asthma symptoms.